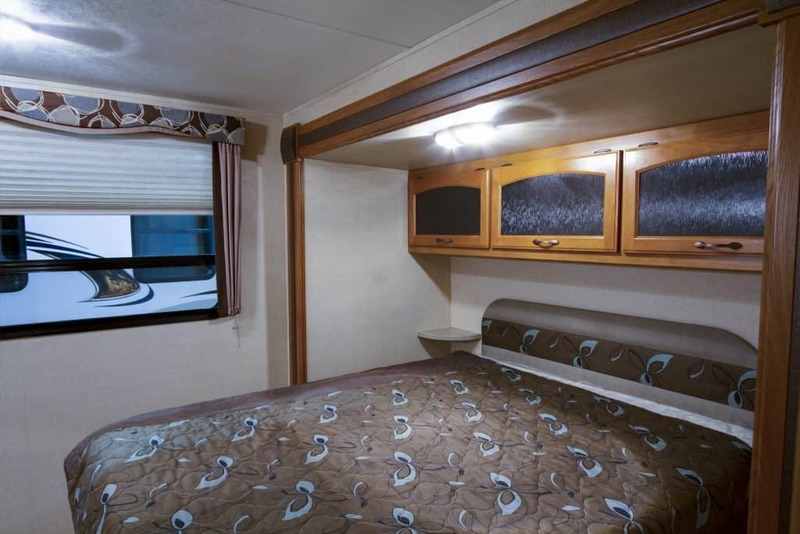 Front bedrooms in fifth wheels are nice because your bedroom isn’t around all of the fuss in the rest of the trailer. Front bedroom floorplans are quite popular as well, due to their functional set up. What are the most popular floorplans with front bedrooms? 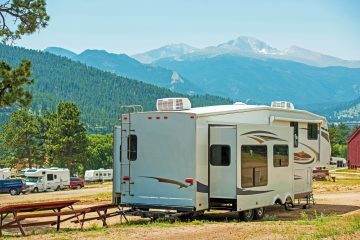 These trailers are some of the most popular and most wanted floorplans for front bedroom fifth wheels. To learn more about each, keep reading! This trailer is great for many reasons, and not just because it is one with a front bedroom. It is a small trailer that sleeps 4 people and has all of the luxury features you’ll want. This trailer is perfect for a luxury vacation with your small group. The front bedroom has a fancy queen bed with a nightstand on each side and a large closet. The bathroom next to the bedroom has entrances from both the bedroom and the hallway as well, so you won’t have to worry about leaving the bedroom to go to the bathroom. The bathroom is quite nice too. Aside from having the dual entry feature, this bathroom has a toilet, a sink with a vanity, and a radius shower. There is also a large linen closet in the bathroom for storing towels and such. 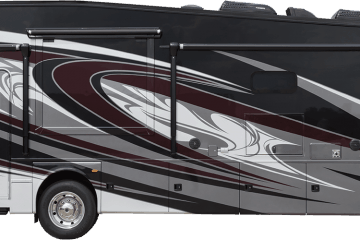 The main room is definitely a crowd pleaser for this RV. This room consists of the living room and the kitchen. The kitchen has a 3 burner stovetop, a microwave, an island with a large sink, and a residential size refrigerator with a 1000W inverter. There is also a pantry behind the entertainment center and a hutch against the opposite side of the bathroom wall for storage. There is also a set of table and chairs by the entertainment center for dining purposes. The living room has a lot of seating and some luxury items as well. There is a sofa against the back wall that doubles as a tri-fold bed. On the next wall over there is a nice theater seat with massagers in it as well. The entertainment center behind the dining table has not only a T.V. set up, but it has a nice fireplace below it as well. 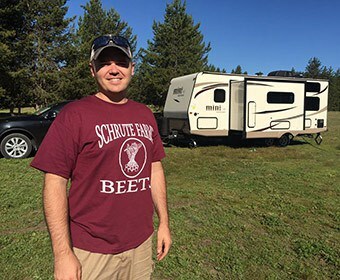 This trailer is great for a small luxurious vacation as well. It has everything you need to survive on your trip and has a homie feel to it. It is also small enough that it won’t be as hard to tow or park places than it would be for a big trailer. The front bedroom has all the basics you will need. It has a queen bed (with a king size optional), a dresser with a T.V. above, and a very large wardrobe with lots of shelves and a washer/dryer prep station inside of it as well. The bathroom in this trailer is completely set up too. There is a double sink vanity with a cabinet for storage against one wall. This way, you won’t have to fight others for the sink in the mornings. There is also a toilet, a small linen closet, and a large shower with a seat in it. Right outside the bethroom there is also a hall closet as well. The main room has quite a bit in it to accommodate both the living room and kitchen, but it is all well set up and quite spacious as well. The kitchen has quite a bit of counterspace to work around with. Ther is an island with a double sink in the middle, a 3 burner stovetop, a large fridge, and a nice microwave. There is also lots of overhead cabinets to accommatade for all of your storage needs. There is also a small free-standing table and chairs for a dining table. The living room area has lots of seating and a good entertainment center system. There is a large sofa against the back wall. THere are also a couple of recliner chairs facnig the entertainment center on the opposite end of the room. The entertainment center not only has a T.V. hung up on the wall and more cabinetry, but also a luxurious fireplace by the couch. This trailer has a set up like I haven’t seen before, but it is a very popular trailer still. It’s actually a quite functional set up. This trailer has a very open floor plan which is nice for the small group it can sleep. The front bedroom is open like the rest of the trailer. There is a nice bed facing a large dresser against the wall. In the very front of the trailer is a small walk-in closet with a washer/dryer prep station inside as well. The bathroom is just off of this room and has a corner shower, a small vanity, and a toilet. The kitchen has lots of counterspace with a double sink at the end of a wrap around island. There is also a 3 burner stovetop and a large fridge. The dining table is a rotatins table with 4 chairs for easy mobility and functionality. The living room has a nice love seat, 2 recliners, and a nice entertainment center. There is a T.V. up on the wall, a desk, and a nice fireplace all in the entertainment corner. The front bedroom in this trailer is super nice and is enclosed like its own area. The residential queen bed is facing the back of the trailer instead of the side and has plenty of space to walk around it with overhead cabinetry and closets on either side of the bed. There is also a nice wardrobe in the wall as well. The bathroom kind of jets off from the bedroom. It has 2 entrances, one from the hallway and the other from the bedroom, which makes it easy to acces from either side of the trailer. There is a simple vanity, a toilet, and a nice radius shower in this quaint bathroom. The main room is an open plan with plenty of room to entertain. The kitchen has lots of overhead cabinetry to make for plenty of storage space, a large sink, a 3 burner stovetop, and a nice refrigerator. There is also a large dinette booth for the dining area in the trailer. The entertainment portion of the main room has a small trifold sofa, 2 recliners with a coffee table between them, and a nice entertainment center facing the seating arrangements next to the door. This trailer is by far my favorite. It is a larger trailer, but it is definitely worth it. 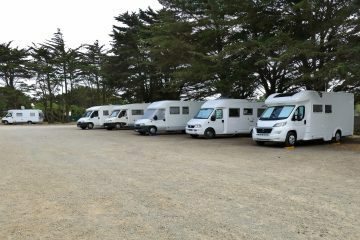 There is plenty of places to accommodate sleeping arrangements for a large crowd when traveling. and planty of space to entertain them all too. The front bedroom has a nice queen bed, a large dresser with a T.V. 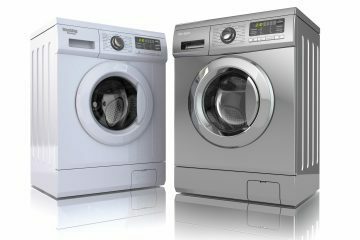 hookup above, and a large wardrobe with separate washer and dryer prep areas. This room is its own little bubble in the trailer which will help give the occupants of this room some privacy. The bathroom is the only one in the trailer and a little on the smaller side, but it is still enough to accommadate such a crowd. There is a sink with a larger vanity set up, a linen closet, a toilet, and a nice walk in shower with a seat. There is another room in this trailer which is actually my favorite part about it. It is a great place to put all of the kids too! There is a fol out couch in this room with an entertainment center facing it for individual entertainment.Above the couch is a loft bed to accomodate more people too. In this room there is also a wardrobe for some storage. The main room is very open and accomodates both the living room and kitchen needs. for the kitchen portion, there is a residential refrigerator, a 3 burner stovetop, a pantry, and an island with a double sink. There is also a large dinette for eating. For the entertainment portion of this room, there is quite a bit it offers. There is a theater seat facing a nice entertainment center with a T.V. and a large couch against the next wall. There is even a ceiling fan above all of this. Another cool entertainment feature of this trailer is the outdoor kitchenette. It has a mini fridge and some countertops that are sure to make meal prep and entertainming much easier. 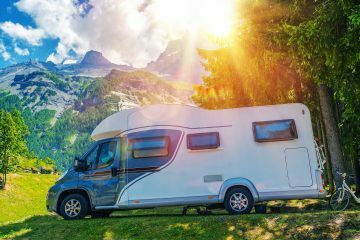 So, I’m not going to be quite as detailed with these RVs, but just in case the fifth wheels don’t seem right for you, here are some other options with front bedrooms. Since this is a travel trailer, it is smaller than a typical fifth wheel. It is ideal for a couple or small family. So if you don’t have a lot of people to accommodate, this might be a better option for you and yours. It has a queen size bed in the front of the trailer. There isn’t much separation from the rest of the trailer, but if there aren’t a lot of people this shouldn’t be a problem. The trailer also includes a slide booth dinette, a rear bathroom, and pass-through storage under the trailer. The storage is great because it gives you a lot of extra space and can be accessed on either side of the trailer (outside, of course). Again, this is probably smaller than most fifth wheels, but it is bigger than the Coachmen. You could fit about six to eight people in it if you needed to. Once again, this has a great queen size bed, and this time the bedroom is actually its own room. The trailer has a great divider separating the bed from the rest of the trailer. There are also double-sized bunks at the rear of the trailer. Aside from the bedroom, the trailer also has a U-shaped dinette and a couch. The dinette and the couch can turn into beds if you need the space. There is a ton of sleeping space in this trailer, so hopefully no one will be camped out on the floor. This trailer also includes panoramic windows and power awning. Basically, the only thing missing is a TV, and really, do you need a TV when you’re camping? 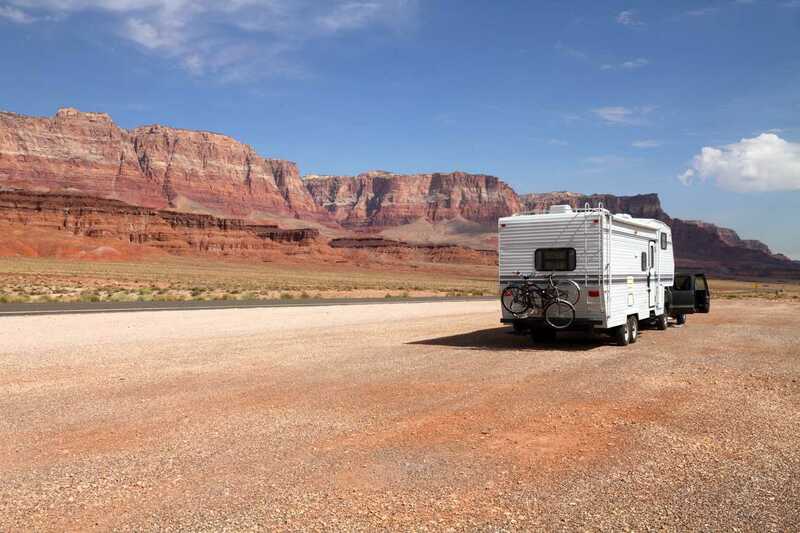 What are the best fifth wheel RV brands?